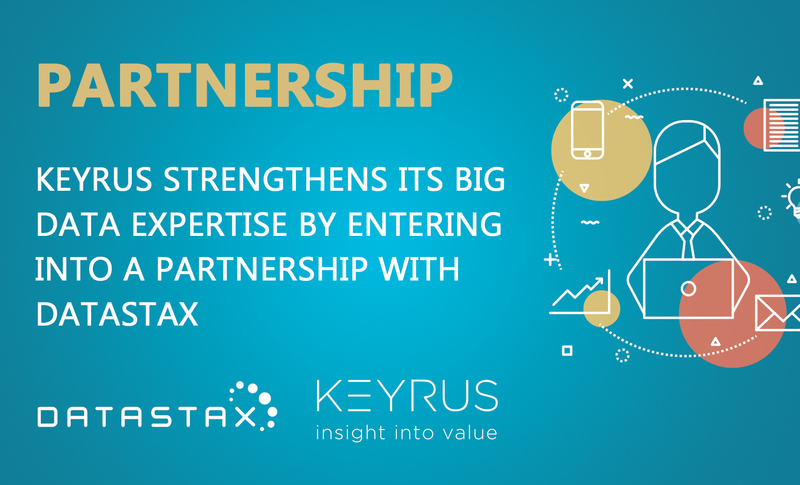 Keyrus announces that it has entered into a partnership with the DataStax editor so as to enrich its Big Data offering. DataStax has created the DataStax Enterprise (DSE) solution, which is primarily aimed at large account customers facing problem issues associated with very large data volumes, requirements in real time, or deployments in several countries' Data centers. It provides a transactional NoSQL database platform that is compatible with Hadoop and has an embedded Spark. DataStax Enterprise addresses the business problems connected with any operational use of data in real time and large volumes: Master Data Management, customer journeys, detection of fraud… Keyrus chose DataStax for the many benefits to be had from its solution. Indeed, DSE has a solid architecture offering the guarantee of uninterrupted operation, coupled with a high level of adaptability in terms of volume capacities and data rates. This solution also makes it possible to render the full context of a piece of data, such as the 360° vision of a customer, within very short time frames, through a fluid and intuitive user experience. This alliance enables Keyrus and DataStax to develop a joint offering for their clients that provides substantial business value and can quickly be integrated into their information systems. This represents a major advantage in the framework of analytical projects that have to be deployed with ever tighter time and cost constraints. The geographical zone for this partnership covers primarily France, but also Belgium and Israel. This tie-up enables DataStax to join forces with a key Big Data player and pioneer that is well established in these different countries. Keyrus, for its part, is able to deepen its expertise by linking up with one of the most innovative technological players in the market. The priority target sectors are Banking and Insurance, in which the Digital Services Enterprise Keyrus and the editor DataStax are already well known, and for which numerous synergies are possible. These two Big Data players did not wait for the official signing of this partnership to start working together. An initial project is underway with one of France's main insurance companies as part of the implementation of the real-time back-end of an international Customer Self-Care portal. "With its functional richness and technical maturity, DataStax Enterprise today represents an innovative and robust solution. This partnership supplements our Customer Centric value proposition and will enable our clients to accelerate their digitalization", comments Aziz Cherfaoui, Big Data & Cloud Manager at Keyrus. "We are delighted by this partnership with Keyrus which, thanks to its expertise in Big Data, enables us to deepen our approach in key markets like France, Belgium, and Israel", comments Xavier Guérin, VP Western Europe at DataStax. "This collaboration enables us to address our clients' needs even more comprehensively and improve their user experience." It starts with a human desire… and when a universe of technology, devices, and data aligns, this results in useful information, and satisfaction for the user. Billions of these moments occur each second around the globe. They are moments that can give rise to a new era, launch an innovation, and forever alter for the better how we relate to our environment. As reflected in its slogan, "The power behind the moment", DataStax is the driver of these moments. Built on the unique architecture of Apache CassandraTM, DataStax Enterprise is THE always-on data platform, and has been battle-tested for the world's most innovative, global applications. With more than 500 customers in over fifty countries, DataStax provides the data management tools used by the world's most innovative companies, such as Netflix, Safeway, ING, Adobe, Intuit, Target, and eBay. Based in Santa Clara, California, DataStax is backed by industry-leading investors such as Comcast Ventures, Crosslink Capital, Lightspeed Venture Partners, Kleiner Perkins Caufield & Byers, Meritech Capital, Premji Invest, and Scale Venture Partners. For more information, visit DataStax.com/customers or follow us on @DataStax. DataStax is a registered trademark of DataStax, Inc. and its subsidiaries in the United States and other countries.